"Xanadu was named as it is near Voodoo Reef and it rhymed"
Michael McFadyen's Scuba Diving - Unkai Maru No 6 The Unkai Maru No 6 was originally built as the SS Venus by William Gray and Co, West Hartlepool, England. She was powered by a single three cylinder coal powered steam engine with two scotch boilers (although in WII Wrecks of the Kwajalein and Truk Lagoon by Dan E. Bailey it is claimed that it is a diesel engine - see later in article). The engine was built by Blair and Company, Stockton-on-Tees. The new ship was 3,152 tons gross, 93 metres (331.0 feet) long and 13.3 metres (49.2 feet) wide. The ship was originally ordered by the Venus Steamship Company, Newcastle. However, after she was launched on 30 October 1905 (completed December 1905), the new ship's first owner was Cornhill Steamship Co Ltd. It was managed by Harris and Dixon Ltd of London. In about 1911 it was sold to Leander Steamship Co Ltd (Managers Scaramanga Brothers) and in about 1918 the Manager changed to Petersen and Co Ltd. It was still registered in London. In about 1920 the SS Venus was again sold, this time to Thompson Steam Shipping Co Ltd with W. Petersen and Co managing her. This ownership was shortlived as in about 1921 she was sold to S. Nakamura of Kinoye, Japan, and renamed the Unkai Maru No 6. The ship appears to have remained owned by the same person/company with some minor name changes (1930 to Nakamura Gumi Ltd, 1940 to Nakamura Kisen KK) till its demise. At some time it was sold for £32,500. However, this is reported to have happened in 1911 to a Japanese company, possibly Nakamura Kisen K. K., and renamed Unkai Maru No 6. I think that this was possibly the sale in about 1921. It may have operated at some time under charter to the Japanese Navy (this is what is implied in Hailstorm over Truk Lagoon by Klaus Lindemann). On 17 February 1944, the Unkai Maru No 6 was anchored just over half a kilometre north of Uman Island, about a third of the way towards Eten Island. There a two different reports of the sinking of the ship in the two references listed below. The first report in WWII Wrecks... it is reported that during the first day of Operation Hailstone, the ship was attacked a number of times. The first was by Grumman TBF Avenger dive bombers from Strike 2B from USS Essex and hits on the port side and port quarter were reported. It was reported to be listing to starboard. Later the same day she was also hit by a plane from USS Yorktown (Strike 1EY) and USS Bunker Hill (Strike 3E). A fire was seen to erupt after this attack. The next day she was again attacked by Douglas Dauntless SBD dive bombers from the USS Essex with two direct hits on the bow and three hits on the rest of the ship. In Hailstorm..., Klaus Lindemann says that at about 1200 hours on 17 February 1944, a plane from Strike 3D from USS Bunker Hill torpedoed the Unkai Maru No 6 . It was reported that the next attack (Strike 3E) had two near misses with bombs and one miss with a torpedo (another hit a coral reef). It is not clear which of these two reports is correct, but there is no obvious torpedo damage and, from what I remember, no obvious major bomb damage that might have caused the ship to sink. The ship was found by Klaus Lindemann on 4 July 1980 during a search using photographs from the attack and a depth sounder. In 1993 Brian Bawcombe filmed a dive on the Unkai Maru No 6. He was diving with the Thorfinn. 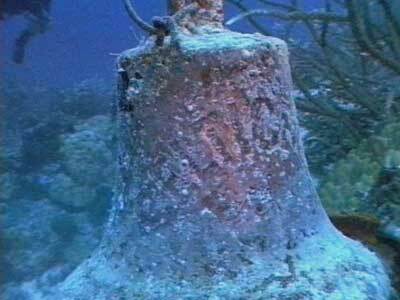 On this dive, he was shown a bell which was hidden in coral nearby. It was said to be the bell of the Unkai Maru No 6. In August 2012 Brian was re-editing the video when he noticed that the bell was engraved with the word CELTIC. It also appears that this word is the first part of a two word name. This is strange and does not seem to match up with the accepted history of the ship as outlined above. Some research by Brian and myself have shown that there was a ship called the SS Celtic King (or perhaps SS Celtic Cloud) which became the USS Celtic. This ship ended up as the SS Celtic and it was scrapped in Osaka, Japan, in 1929. How did the bell end up being transferred to the Unkai Maru No 6? Perhaps we will never know. It is certain that the ship in Chuuk is not the former USS Celtic as it was a far bigger vessel. Today the Unkai Maru No 6 lies upright on a sandy bottom. The depth to the sand is about 40 metres and the decks 23 to 25 metres, shallower on the bridge. After anchoring on the bridge, a short swim takes you to the bow where you can enter the forecastle which is totally open as the deck has been completely eroded away. There is a very nice bow gun and right at the bow you can drop into the chain locker where you will see that the port anchor must be out as the chain is nearly all out. The starboard chain is completely in the locker. There is a spare anchor behind the forecastle. Hold 1 is very interesting (it is not empty like Lindemann says). There are sandshoes, boots, gas masks, bottles, shells, a wheelbarrow on the starboard side and piles of newspapers. Hold 2 is mostly empty except for some large bits of timber. There are no 'tween decks in either hold. Behind hold 2 is the bridge. You can enter through the port side door and here you will see a small hold. This hold goes up through the superstructure and is full of coal (for the engine). It seems that this hold joins hold 2 as well. Around this area you can catch glimpses of the two boilers through various doors and even through the back of the small hold (you cannot enter these areas as it is too small). The engine room can be entered through a door on the port side of the engine. From here you can only just see the engine and it is a bit of a tight squeeze to get into the main section of the room. You go first down and then around to your right before coming out in the engine room. However, once you do it is very open and light and the engine can be clearly seen. This is quite clearly a steam powered engine. You can also see the boilers from here but it is very crowded/cramped there. You can exit the engine room via a door on starboard side (the skylights are open but I cannot recall if you can enter/exit through them. From here you swim to the rear and exit out another door at the rear of the superstructure. Hold 4 is located here. It is empty as is hold 5, although there appeared to be some large hoses at the bottom. The stern of the ship is quite nice. There is no gun but the steering mechanism is out in the open (as it was on ships of this vintage). There are two depth charges on the port side of the stern and another small hold. There is a very large prop which can be clearly seen. The depth here is about 38 metres. Returning to the bridge you can see the large funnel. It is lying on the port side of the superstructure, with the top facing the stern. There is some damage in this area, but it is not clear if this was caused by the bombs or the ravages of time. On this dive I did a 27 minute bottom time which meant I had to do decompression of about 11 minutes at 3 metres. An excellent wreck that does not have a great deal of artefacts to be seen but can be explored in one dive.